by Young Green activist Sahaya James. 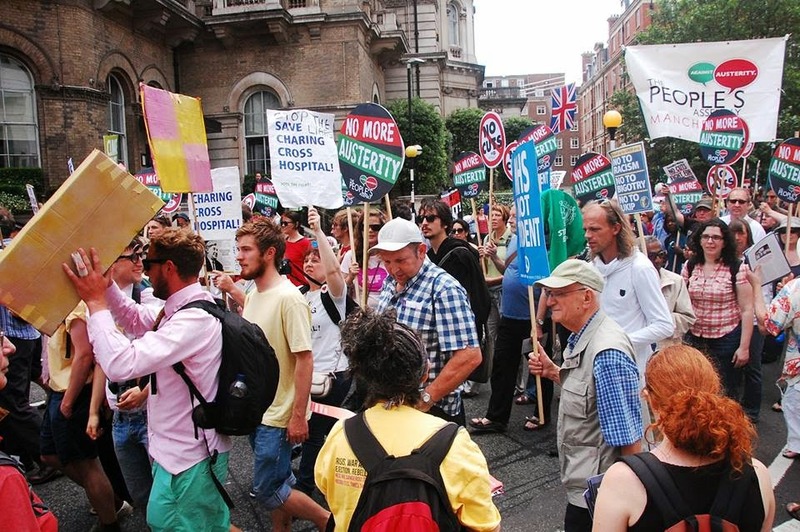 On Saturday 21st June I joined an amazing 50,000+ other demonstrators at the #NoMoreAusterity National Demonstration organised by The People's Assembly Against Austerity ‘to demand the alternative’. A wide variety of people, including disabled people, teachers, nurses, care workers, firemen, students, journalists, Franciscan monks, anti-war campaigners (from CND and Stop The War Coalition), Trade Union leaders, MPs (Caroline Lucas, Jeremy Corbyn, John McDonnell and Diane Abbott) and various comedians, all joined together to protest against the ideologically-driven austerity imposed on this country by the Con-Dem coalition with the tacit support of Labour, which is punishing the poor and disabled, making them still poorer and more insecure, denying opportunities to the young, while at the same time allowing the rich to grow richer and to siphon our national wealth off to their overseas tax havens. It was always clear that whether someone was there because they were feeling the injustice of an increasingly inexcusable education system or because they lost their job due to a economic climate they did not cause, everyone there supported each other's fight and marched in solidarity with every person and their cause. It was so inspiring to see such a united and impassioned movement and it felt amazing to be a part of it. 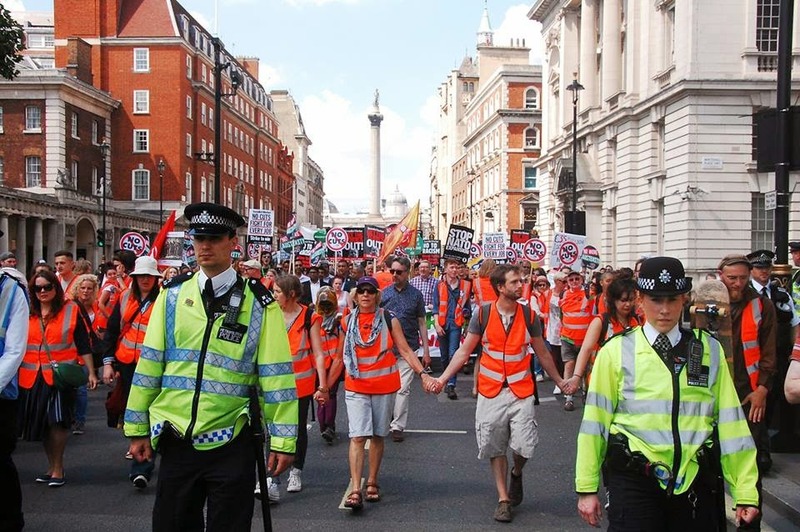 During a number of the talks, we were reminded that the 50,000+ there were only a small proportion of a far wider movement, and that this movement is made up of local groups and campaigners, whether a trade or student union, a local People's Assembly group or a branch of a party providing a progressive, genuine alternative. 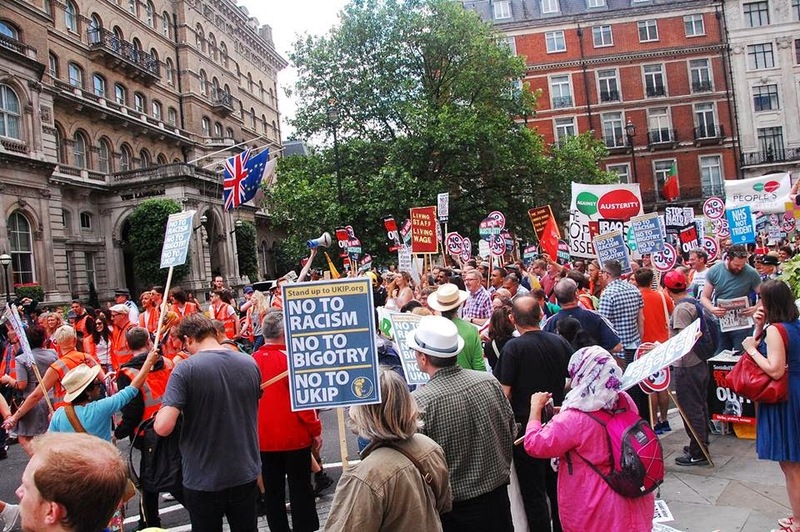 The protest, which began with a march from BBC HQ to Parliament Square, and ended with many inspiring speeches, was a great success, but was studiously ignored by most of the mainstream media. Apparently the BBC failed to notice that 50,000 protesters with banners, huge balloons and loudspeakers gathered on their doorstep, so they reported nothing about it until people started to complain, after which on an obscure corner of their website they gave this pathetic three-sentence report with a 24-second video. Most national newspapers did not give even this much coverage, except for this article in the Guardian and this one in the Independent. Other than on social media, the best coverage was given here by RT. This media blackout clearly demonstrates that we have to fight for justice against not only the three main parties in Parliament, but also the entire national media.